We were done with Siddeshwar Temple and Solapur Fort aka Bhuikot. 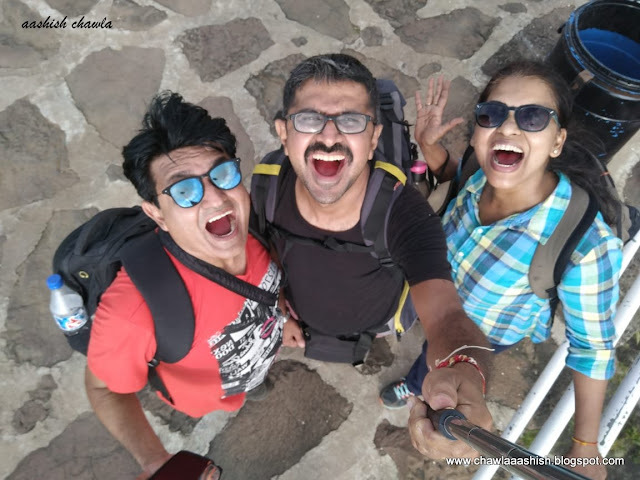 ( you can click on the links to read about our earlier journey) The next destination on our card was Naldurg Fort, which is situated around 50 kms away from Solapur. We started to walk from Bhuikot Fort to Solapur Bus stand which is hardly 1-1.5 kms away from the fort.Walking through the local markets we reached the Solapur Bus stand. Finding the bus at Local bus stand is always a challenge however we were lucky we were guided by a local person and we boarded the bus going towards hyderabad. 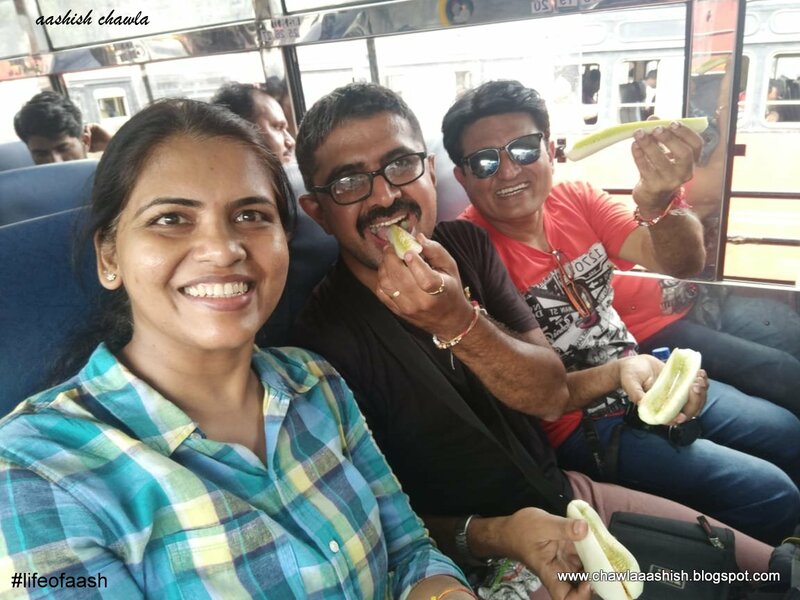 As the bus was starting from here so we had empty bus for ourselves, As usual I jumped to grab the window seat and for our time-pass we bought cucumber which felt so refreshing in this heat. My co-travellers Nikhil and Pooja took a cat nap while I was doing my videography, Boss window seat aise hi toh nahi li thi...The bus journey lasted close to one hour and soon we reached Naldurg bus station. One can have glimpse of Naldurg fort from the Bus stand. Hence we started walking toward the fort, We had to walk for 15 minutes on the highway and then thru the village to reach the fort. 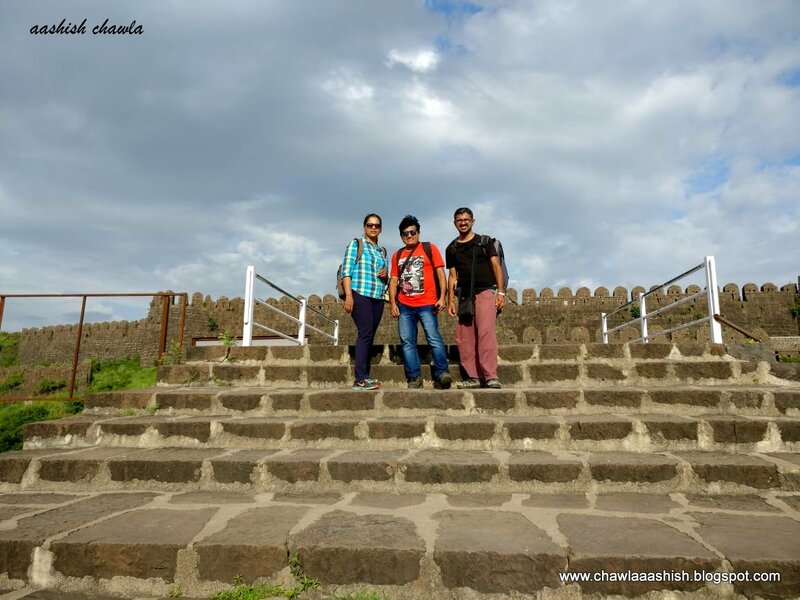 Finally we were at the gate of the Famous Naldurg Fort. There are different version about the construction of Naldurg Fort. 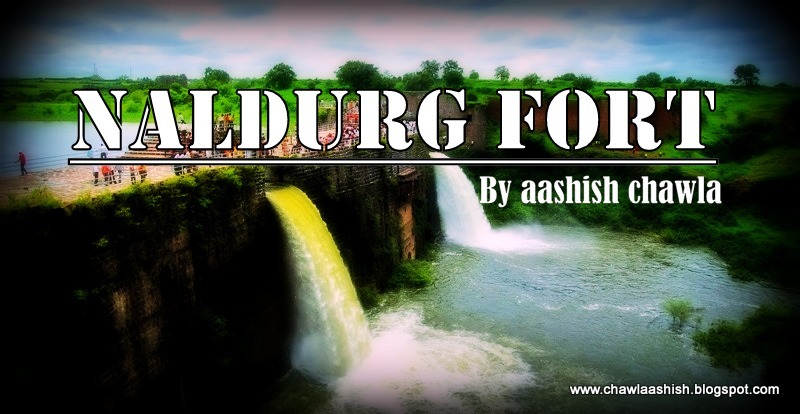 One belief is that it was built By Nalraja, Hence the fort and the place got the name Naldurg. 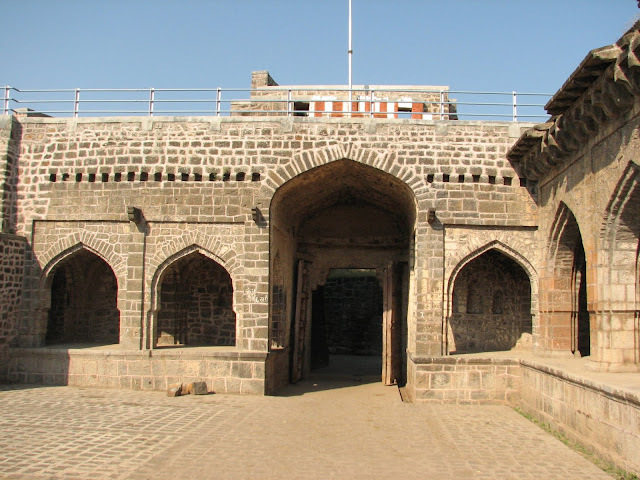 Then there is another belief that the Chalukyas of Kalyani built this fort.This fort was also known by the name Yeral, when it was under the Bahamani Sultan from from 1351-1480, Later it was handed over to Mughal Empire. Later the Adilshahi rulers constructed the massive impregnable wall of the fort in the year 1558. 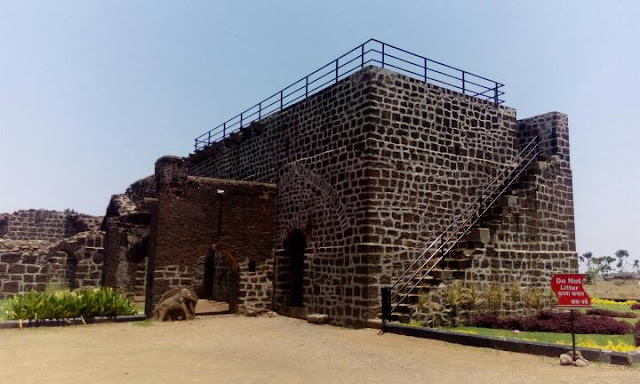 In simple words what we see today of Naldurg fort the credit goes to Ibrahim Adilshah II (1556-12 Sept 1627). Upon reaching the fort entrance we were informed that we had to buy entry tickets. As ASI is maintaining this fort so tickets are issued by them.We bought the tickets, here we also came to know that you are charged for carrying DSLR camera. Mobile phones are allowed for free. Another interesting thing is that there is a luggage room too near the entrance of the fort where by paying a nominal charge you can keep your bags. The moment you enter the Main Gate of the Fort you can see that the efforts are been made to clean up the fort. The beautiful pots are lined up along the ramp as you pass through two gates viz Hurmukh Darwaza and Hathi Darwaza to enter the fort. We come out of Nagarkhana to see huge view of the fort from inside. Once you reach inside the fort it opens up a huge view of the fort area with fountains.Lots of efforts has been made to beautify this fort. Few years back this fort was quite neglected however a initiative was undertaken to adopt forts and this fort was one of them. Where adoption of Red Fort by Dalmia group raked up controversy on other hand the initiative by Maharashtra govt to adopt 371 heritage sites proved to be a big flop show with only 2 forts been taken up for adoption. The reason been for the flop show was that there was not much incentives for the corporate in terms of gate money or the icon use and also many of the sites been fort and temples charging entry fees was little difficult. Anyways as this fort is adopted so let us enjoy the views. our resting place for having lunch. Green lawns and few ancient structures are the inviting sights for a traveler like me. It was almost 2 pm when we reached here so we decided to have our lunch sitting under the shade of the tree. We generally carry our lunch so in no time we were done and moved on our exploration. We started from the right side because I had heard so much about the Nav Buruj. It is said to be a nine petal lotus kind of Bastion. This bastion is unique because it has two floors within it. The view from this bastion was amazing. We explored a bit on the top and as usual stole a moment to click few of our pictures. After all the hard work of climbing up and down photo toh banta hai bhai. One of the structure outside the fort wall. We were given to understand that Naldurg is a huge fort hence one requires lots of time to cover its each nook and corner. Personally I felt that if you are a serious fort lover then you need a full day to cover every square inch of this fort. Reached a location from where would see a huge lake! Yes this Fort has a lake and that too is huge, I was left open mouth with OMG written all over my face. I have visited many forts in Maharashtra but never seen something as amazing as this. One can take boat ride, Banana ride, Water scooter and many more water sports activity. This is perhaps one of those few forts which offers such delightful water sports. A little walk further we came across another interesting structure. This structure is perched as a watch tower kind of thing. In other words this structure is the highest portion of the fort and is called Upali Buruj. There are close to 70-75 steps to climb to the top and Pooja and me raced on these steps with Nikhil shooting us on the camera. These silly antics keeps us going and we find our fun in them. Upon reaching the top we saw two cannons, quite a long one. This bastion was made for keeping watch and to oversee everything, I can vouch for this, because I could see the highway from the fort with the vehicle movement on it. This bastion is at the centre of the fortification of the fort.Due to which one can have a bird eye view of the entire fort from the Bastion. View of the fort from the top. For a history lover these cannons are something to be proud of and sacrosanct in a way, but its sad to note that for people who just come to spend an outing here, its a place of fun, and these canons are a resting place, a magical broom kind of thing to sit on. Parents without realising I feel are giving wrong indications to their children when they make them sit on the cannons just to enjoy. Please respect the historical past. 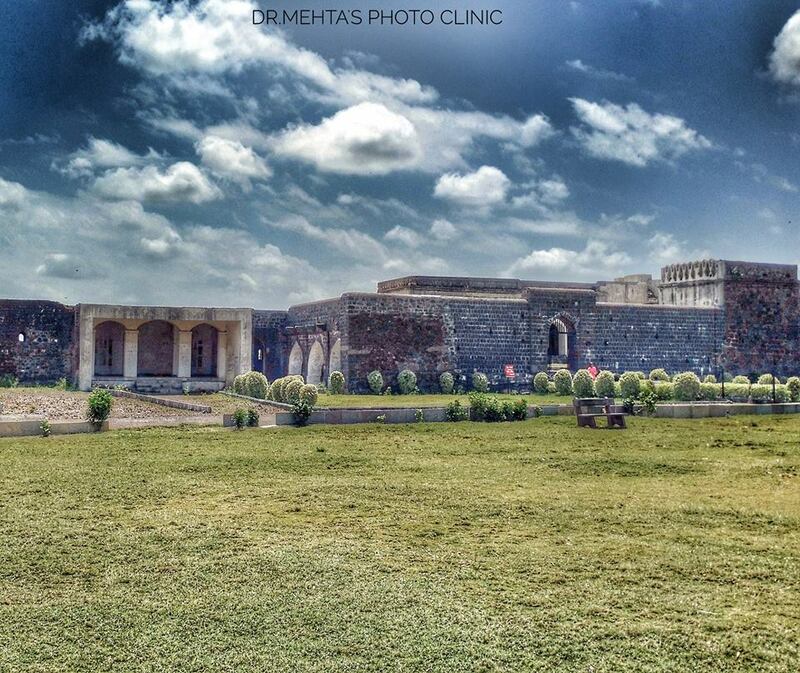 We spent some time at the Upli Buruj enjoying the cool breeze and enjoying the mesmerizing 360 view of the fort. Clicking pictures from vantage point is always so delightful. From here we moved on the one of the most unique structure on this fort and it is called Pani Mahal. Actually in 1613 AD, Ibrahim Adilshah II built the weir or dam on the river Bori and constructed Pani Mahal. This dam itself is an engineering marvel of its time. This Dam is 90 feet tall, 275 metres long and approx 31 metres in width. Pani Mahal is an interesting structure whereby when you come on the dam section there are stairs going down and you come across a floor kind of thing. Not much is left today to see here though. One can catch the glimpse of the gushing water of the dam from the window of this section. This floor was made in such a manner that though this palace is on the wier yet the water never passes through it. Isn't it an amazing architectural marvels of yesteryear. The sun was coming down and the breeze was getting all the more cooler so we thought to chill out on the top of Pani Mahal. The river water was glittering in the evening sun and the view looked mesmerising. It was now time for us to say goodbye to this lovely Fort and begin our journey back to Solapur Station from where we were to take night train to Mumbai. From Solapur: Naldurg is situated around 50 kms from Solapur. 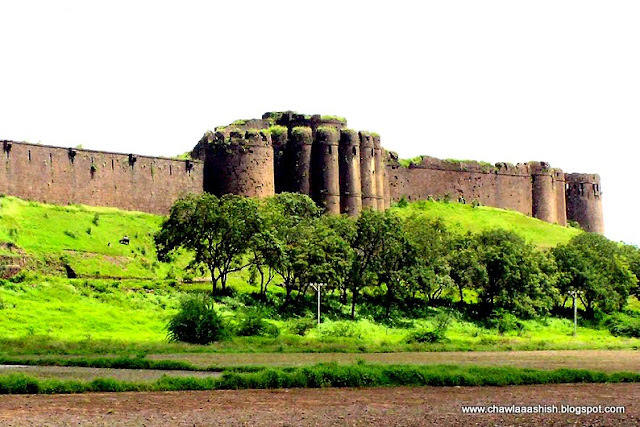 The fort is situated on the Solapur -Hyderabad highway in Naldurg Village. There are regular State transport buses plying from Solapur to Naldurg. If you are visiting on Sundays park your vehicle somewhere on highway and take a walk to fort. Sunday is market day and its too hard to drive four wheeler in narrow lanes with lots of roadside stalls and crowd. If you wish to have drone tour of this place click on the link I have shared below. Thank you for reading my blog, Please do leave your comments and feedback in the comments column given below. Your views are very important for me. Also if you like the blog please do join my site and share my blog.